"[A]n eloquent and well-informed plea for us to change exploitation into respect. Not only is More Than a Meal an excellent account of the history of hunting, farming, and killing of the turkey, but it is a penetrating examination of the culture of Thanksgiving, in which the turkey plays a central and demeaning role." 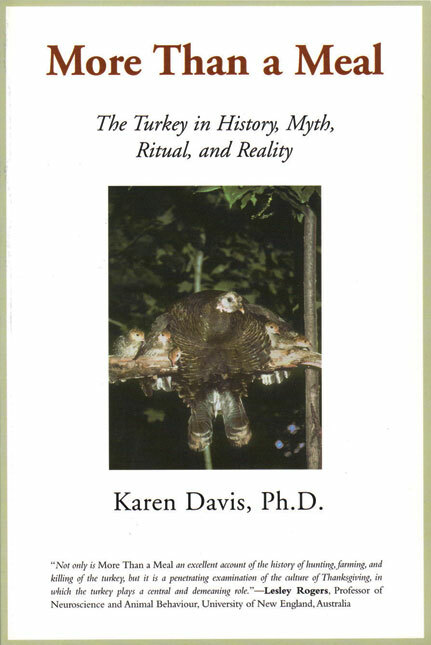 "Karen Davis shines a new light on the unfortunate, much maligned bird that is the center of America's Thanksgiving ritual, and thereby illuminates the lies and hypocrisy that surround our eating habits and our attitudes to animals. More Than a Meal challenges all Americans to think about the values that they want their annual family ritual to embody." "[A] thought-provoking book because we are taken on a journey to look at the unsightly corners of our attitudes and practices of past and present. . . . Can we read this rousing book without wishing to improve the lot of these magnificent birds?" "Serious but engaging. My advice to anyone who thinks that turkeys are stupid, unappealing birds would be to read this book." Learn All About the Turkey in History, Myth, Ritual, and Reality!